Ever wonder what those smooth singing Brazilians were saying in Portuguese? Well, now you can finally know. Done by a super white vocal group with their take on the songs of Brazil–sang in English of course! a) it is really awful sounding b) it’s done by a very ‘square’ artist c) it might actually be a fun album. This album has all three! It will slowly grow on you, especially if you like your music square, full of clichés, and not in fashion. This album isn’t totally weird, but it does have some strange an corny elements to the songs. However, that said, The Hi-Lo’s can certainly sing and if you like your harmonies close, then this album sure has them in spades. 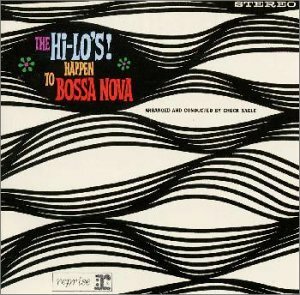 This entry was posted in The Hi Lo's Happen to Bossa Nova and tagged The Hi Lo's Happen to Bossa Nova on December 13, 2014 by dunnmore27.